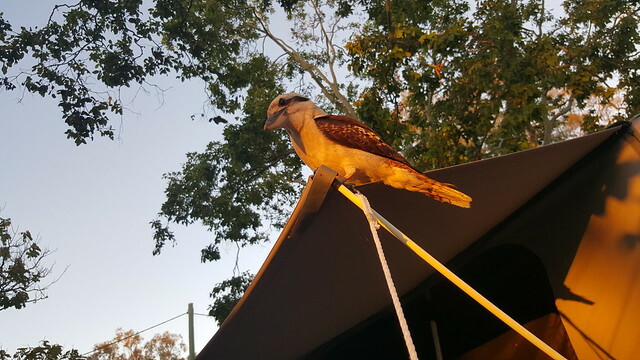 We had an easy trip today, on the barge from Straddie, and then heading north to the Sunshine Coast and a spot near the beach on the Noosa Northshore. We arrived later in the afternoon, and I was able to give the car a quick clean in the carwash located next door in order to get as much of the sand and salt off the car as possible. Driving into the park we were surprised how few other campers were there. We had been expecting it to be very busy, and the place was almost a ghost town! No complaints here, as we were quite happy there were fewer crowds than expected. 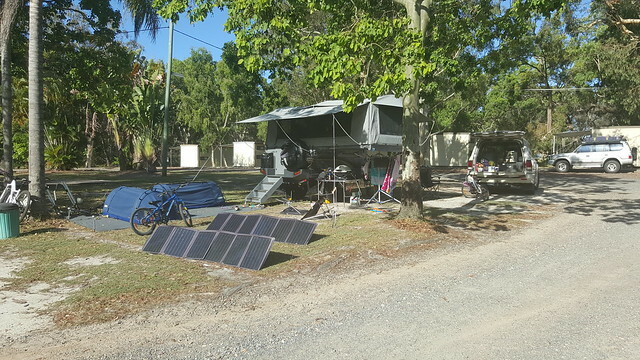 Camp site set up, catching some solar from the afternoon sun. The next few days were spent looking around Noosa, doing a bit of shopping, picking up some supplies, and doing the tourist thing. Every Saturday the Eumundi Markets are on. Apparently this is a pretty big thing, so we got going pretty early to check them out. Rach and Ella seemed pretty impressed, and said there was a big variety of different things there. I must have been looking at the wrong things, as once I’d seen about 10 stalls, they all looked pretty similar to me! We managed to escape with the bank balance mostly in-tact before stopping off at a local shopping centre to pick up a few bits and pieces at the same time. 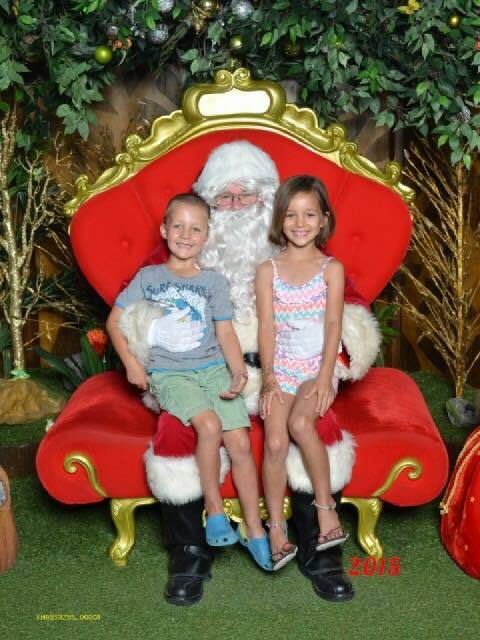 The kids were able to have a photo with Santa at the shops which was a highlight for them. The pool at the Noosa Northshore Retreat was quite nice and we spent a fair bit of time just hanging at the pool and keeping cool. It was particularly nice after I went for a ride one morning, to come back and jump in the pool with the kids. This little fella was particularly cheeky. Would take the food straight off your plate! Our campsite was nice and shady, however, the trees which provided that shade also saw fit to provide sap. Lots of sticky sap all over everything, the camper, the kids swags that were out in the open this time, the car… EVERYTHING! We’re hoping to have some rain at our next stop to give everything a good wash and bring an end to our sticky hands! This shows how much space we had… and also those sticky, sappy, trees! When we were booking this site, I had originally been looking and there seemed to be a 7 night minimum stay. However when Rach later went online to book, she had no problems at all booking our 6 nights. This seemed strange, but we didn’t think too much of it. Then, when we arrived here, I was expecting to be closer to the beach, but again, just went with it. It wasn’t until I went for a ride exploring one morning, that I made the discovery that we had indeed booked the wrong place! 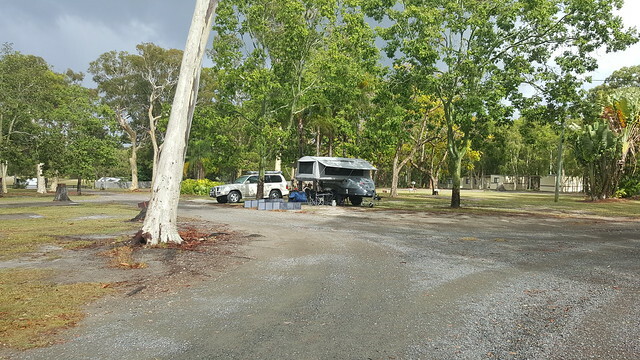 I’d been looking at the website for Noosa Northshore Beach Campground, but Rach had booked us into the Noosa Northshore Retreat. The Beach campground seemed MUCH busier, and was right on the beach. In hindsight we were quite happy where we were to have less people, and access to drinking water, that wasn’t available on the beach. 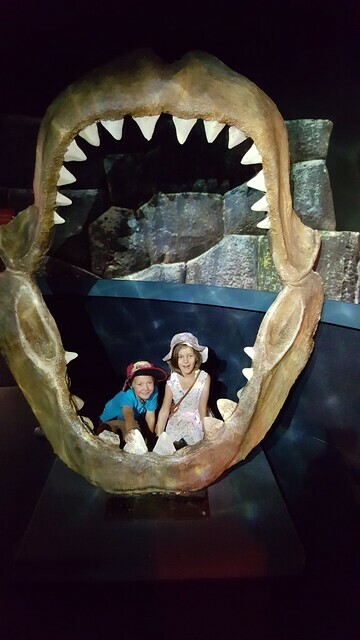 On our last day here we headed down to Mooloolaba and took the kids to Underwater World. We had a fun time here and watched the Seal show as well as checking out all of the other sea life. We then did some shopping to collect some supplies for our next stop, before having dinner at the house of an old mate of mine from work. It was a real treat to catch up with Andrew and his wife Julie and chat about old times! Yet again, 6 nights here was gone in what seemed a blink of an eye. With the sun rising at about 4:30am, it isn’t too difficult to get moving early in the morning and get things packed up. Once our water tanks were completely filled, and bikes attached, we were back down the road to the car wash to remove as much sap as we could before heading off to our next destination. Cost: $336 plus Ferry trips across the Noosa River – $16 with car and trailer, $7 for car alone.